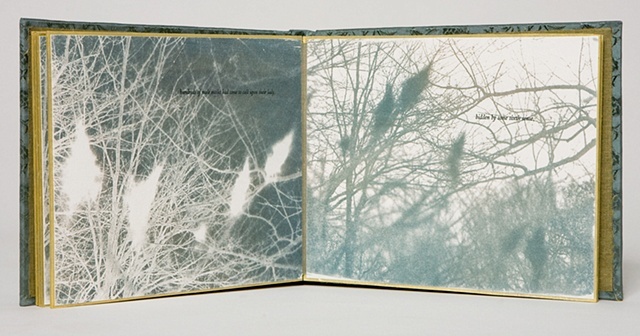 One of a kind artist's book with bleached and toned cyanotype images, handset letterpress, silk, acrylic, metallic thread. she was a great peacock moth. then opened the window to the night. I made Fabre’s Moth (sixth sense) after reading an account in an old science almanac about the discovery of pheremones in the 1870s. The possibilities of senses beyond the five we all know interest me, and this book is a memorial to Fabre’s discovery and also a narrative about personal independence. I work in techniques of photography that were in common use during Fabre’s lifetime, based on straightforward principles of science--the mixing of chemicals and coating of paper, then exposure of that paper to the sun and water. This early photography fascinates me because, like Fabre’s experiment, it is so straightforward, yet results in something complex.